The Mizuno MP-T5 wedges feature the renowned Grain Flow Forging process delivering the feel and precision where it benefits the player the most, around the greens. It has a refined teardrop shape that is inspired by Luke Donald. There are now unbelievable 25 combinations of loft and bounce, with 5 sole grinds, to suit the needs of even the most discerning wedge player. It also features Quad Cut Groove that utilize a wider, shallower groove from 54-62 lofts (to grab softer, partial strikes) and a narrower, deeper configuration from 49-53 degrees (for fuller shots). 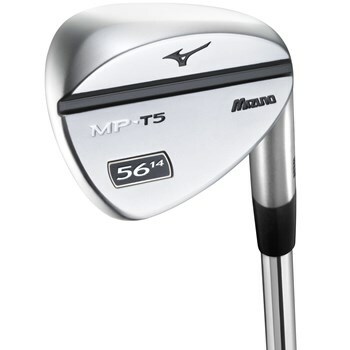 When it comes to wedge performance, the new MP-T5 is the total package. Grain Flow Forged: From a single 1025E Pure Select mild carbon steel billet for soft, solid, consistent feel. 25 Loft/Bounce Options: All with Tour Inspired sole grinds. White Sating and Black Ion Finishes.